The Hyundai ix35 Fuel Cell has been selected for the second consecutive year by the European Commission-backed Fuel Cells and Hydrogen Joint Undertaking (FCH JU) to demonstrate the real-world benefits of hydrogen fuel cell technology. The world’s first production fuel cell electric vehicle, the ix35 Fuel Cell, will be made available throughout 2013 to members of the European Parliament, European Commission officials and other policymakers for test drives in Brussels, Belgium. Hyundai plans to build 1,000 examples of the ix35 Fuel Cell by 2015 for lease to public and private fleets, primarily in Europe. A total of 17 ix35 Fuel Cell vehicles have already been ordered by the cities of Copenhagen, Denmark and Skåne, Sweden. 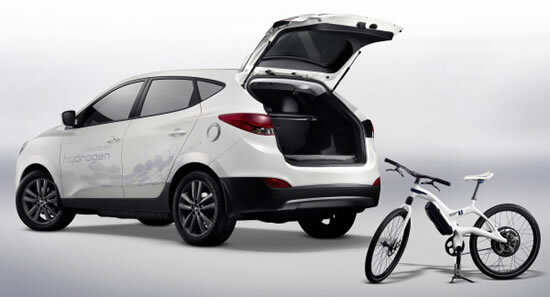 Using Hyundai’s proprietary technology, the ix35 Fuel Cell’s fuel cell stack converts hydrogen into electricity, which turns the vehicles motor. The only emission generated is water. The ix35 Fuel Cell can be refueled with hydrogen in only a few minutes. It accelerates from 0 to 100 km/h in 12.5 seconds, has a top speed of 160 km/h and can travel 594 kilometers on a single tank. In January 2013 Hyundai became the world’s first automaker to begin assembly-line production of zero-emission, hydrogen-powered vehicles.